Cowgirl is an interesting restaurant – I can’t decide if it’s touristy or just good fun. The excessive themed décor makes it kind of cheesy, but it feels more sincere and the food is better than you would expect from a theme restaurant. I came here for dinner with a friend – and remembered that I had seen a veggie burger on their menu previously, although at the time I was sans camera and in the mood for a quesadilla instead. 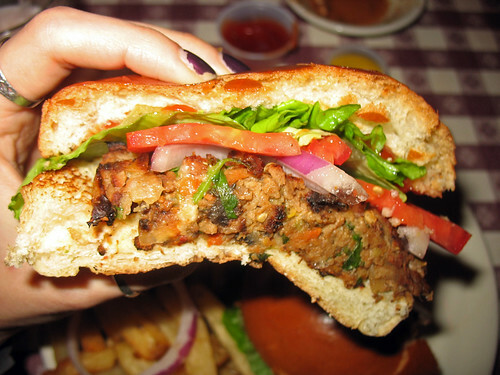 But this time I was prepared, so I ordered the “garden veggie burger”. Our waitress, in answer to my questions, informed me that it was indeed an entirely vegan burger (unless you ask for cheese on it, of course). I would bet that the coleslaw it is served with on the side is not vegan, but since I never eat coleslaw anyway I simply disregarded that part of my plate. The fries were just okay - not the best. 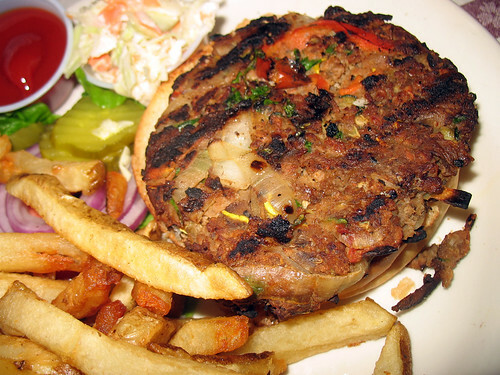 You can definitely tell that the patty is made fresh in their kitchen – look at all those vegetables poking out! onions, carrots, broccoli, spinach, corn, peppers… mixed with a base of black beans. Someone clearly put some thought into coming up with this menu offering, which is always a pleasant surprise for a vegetarian eating in a very non-vegetarian restaurant. It was pretty good. Very middle-of-the-road for veggie burgers once you’ve tasted some of the mind-blowing ones that I’ve been fortunate enough to eat, but still definitely much better than the generic frozen patty they certainly could have gotten away with serving at such a meat-centric place. I would have liked something with a bit more of a kick, a stronger flavor to make it more memorable. But the veggies were good, nice and juicy and well-cooked. The bun was pretty standard too. 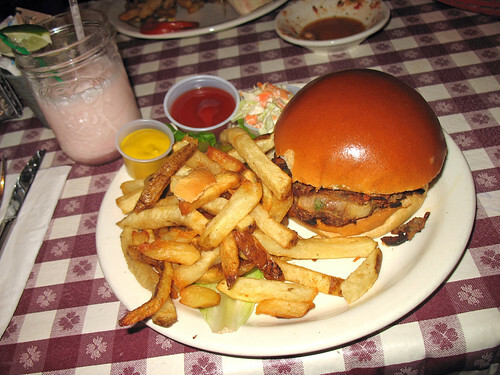 As were the toppings – fresh and juicy tomato, onion, and lettuce. It would have been cool if there was some unique sauce to give it extra flavor, maybe something to tie it into the Tex-Mex theme more. Ultimately, it was filling and satisfying, but not amazing or memorable enough for me to come back to try it again. There are too many other vegetarian dishes I could order that I would enjoy more at this particular restaurant. P.S. – their frozen margaritas are really good. And I don’t even like margaritas, normally.